Synopsis: "Adoption Nation: How the Adoption Revolution is Transforming Our Families - and America takes on the challenge of explaining the historic changes enveloping us all - and does so with a unique combination of engaging prose, gripping stories, insightful perspective and exceptional research. Inspired by his Pulitzer-nominated series while a reporter with the Boston Globe, the first edition of Adoption Nation (2000) captured an important piece of U.S> history and was a game-changer for child welfare professionals, policy-makers, and members of what Pertman calls "the extended family of adoption" (adopted individuals, birth and adoptive relatives). The new, fully revised edition updates the "adoption revolution" with all of its joys and disappointments, its personal and policy issues, its complexities and controversies. 'There's no exaggerating how much has occurred over the last decade - from the adoptive mother who recently 'returned' her son to Russia, to the children orphaned by the earthquake in Haiti; from the ongoing debate over transracial adoptions, to the still-unregulated Wild West of adoption on the Internet; from the decline in secrecy and shame in adoption, the the explosion of reunions between adopted people and their birth families; and from the precipitous drop in international adoptions to the soaring rise in adoption of boys and girls from foster care, including by growing numbers of gay and lesbian parents,' said Pertman." Review: I found this book to be so informative. I have wanted to adopt a child for a long time. My husband is not there yet. I would love to adopt a boy close to my children's age. This book has given me a lot more to think about. One of the best features of this book, is the Adoption Resources. I had no idea where to even start, but I sure do know. Another feature that I loved about this book was the index. For example, if I want to find where I read about "Older children," there is an index that leads me exactly to where it is discussed in the book. I think this is so valuable, given the amount of information contained in this great book. If you are even considering adopting, going through the adoption process, or just want to learn more about adoption, I recommend picking up this book. 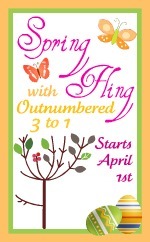 To celebrate Spring.....Outnumbered 3 to 1 is hosting an amazing Spring Fling event! The Giveaway: We have three copies of the Adoption Nation book to giveaway to three lucky participants. Become a follower of Seaside Book Nook blog (once you become a follower/Google Friend Connect, or if you already are, leave a comment here. Please leave a separate comment for each extra entry, otherwiseit will just be counted as one. This giveaway is open to residents of the US until April 24th at 11:59 pm. Since I take care of children as a profession I would love to work on understanding more about adoption. I have also thought about adoption as a way to have a child.